Information is a key to behavioral change and that’s why Robb Barnitt started Dropcountr, an application that can help customers save water by using technology to better understand their usage and offer the best opportunities to conserve. Water Deeply spoke to Barnitt about his company and its impact. Robb Barnitt wanted to find out how much water he was using. He’d been working on energy efficiency and renewables for years, then he started getting interested in water issues. But what seemed like a simple inquiry didn’t have an easy answer. And thus began the idea for what would become Dropcountr, a mobile and online application that can track water use and provide a comparison with similar water users. Barnitt recently spoke to Water Deeply about Dropcountr and how it can help Californians save water during the drought and far beyond. Water Deeply: How does the app work? Robb Barnitt: We partner with water utilities and basically sign a contract to access their meter data, so we’re taking water usage data at the individual account level for all the accounts in a utility service area. We look at that information, we analyze it and we present it back through our platform to two user groups. The first is utilities themselves. As time went on and we engaged with more utilities, we came to understand that they really lacked access to modern software. Tthey may have a few software options to look at information, but very few of these were interoperable. So we built a platform to help utility staff get their jobs done on the day-to-day. 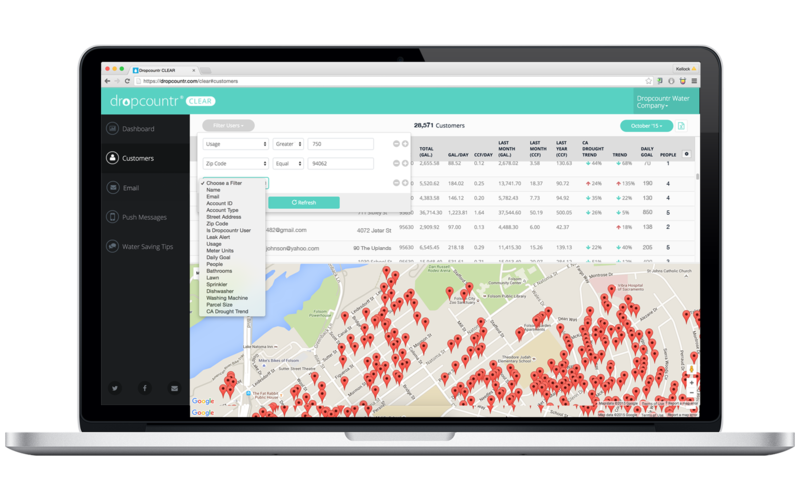 On the consumer side, we typically we conduct outreach to utilities’ customers, let them know that Dropcountr is available and they can start gaining access to their data in real time – all they have to do is sign up. They can also get some targeted curated tips on how to conserve and how to engage in rebates offered by their utilities – save water and save money at the same time. Water Deeply: What’s required by utilities to work with you? Do they have to have newer “smart meters” or can they still be using the older analog meters? Robb Barnitt: Well, we like to see new technology penetrating in the market. Generally speaking, smart meters have maybe 20 percent penetration at the moment, and I think that our current customer base has a similar proportion. For 20 percent of our customers, we have hourly data; for the rest, it’s monthly. We can showcase basically any data, regardless of how granular it is. But there is more value in more granular information that updates more frequently. However, we have been successful in areas that have only monthly reads. Water Deeply: Do you think smart meters will become more pervasive soon? Or are water utilities too slow on the uptake with new technology? Robb Barnitt: Both. Most people say that water utilities are five or 10 years behind the energy utilities and I think that’s probably true. But I think that everyone realizes that smart meters are the future and there are a number of elements of value to the utility in installing the best available technology. I think the hang up is general recognition. I think a lot of people think it is too technologically sophisticated and it doesn’t apply to them, or it’s too expensive and it’s something they couldn’t afford for a widespread deployment. I think it is changing as more and more people deploy smart meters. Water Deeply: Where are you currently working with utilities? Robb Barnitt: We have about 10 utility customers today, we have about a half a million accounts. Folsom, California was one of our first customers. They did a one-year pilot and actually just signed a three-year contract renewal. We also have a number of customers in Southern California that span public utilities as well as investor-owned utilities and we’ve been making some inroads into other areas outside of California – our first customer in Texas is Austin. Water Deeply: Where does your revenue stream come from – customers or utilities? Robb Barnitt: Our revenue comes straight from the utility, the apps are free for end users to download and sign up and start saving water. Water Deeply: What’s the biggest benefit for the utility? Robb Barnitt: The enterprise software product that we have creates a lot of value, to see that information in a more intuitive format, that is one big piece. We also have a streamlined customer relationship module so customer service staff have a better tool at their disposal to respond to customer inquiries. Another one is communication. The historical communication paradigm of utility to customer has been paper-and-postage based, which is a very expensive way to communicate with anyone and typically it’s in a negative format. You don’t hear many positive things from your utility, you usually just get a bill. With our platform utility, staff can filter and sort all of their accounts into groups they’d like to say something to, and they can send that group an email or a push message to mobile. It’s targeted communication: it’s immediate; it’s more efficient compared to paper and postage. Finally, what we found from a conservation perspective is that people just having access to information that they can understand – we present water use in gallons, as opposed to CCF [hundreds of cubic feet] – which most people can’t really visualize. Just accessing that information leads to behavior changes and different decisions around water use. And so in the city of Folsom, we’re seeing an 8 percent conservation benefit with Dropcountr users compared to non Dropcountr users. And among the highest water users, the gross offenders in terms of water use, who have the largest opportunity to conserve, we’re seeing an even higher conservation benefit – to the tune of 12 percent. In terms of [conservation] mandate compliance that all utilities in California are subject to this at this point, this is a very cost effective way of helping achieve those at the utility level. Water Deeply: What other information can people see using Dropcountr? Robb Barnitt: We show folks how much they are using, hour by hour, day by day, month by month, whatever we have data to support. We also show their usage as a function of rate tier, so many utilities charge you a different per unit rate depending on how your usage is escalating. So we show how a customer’s usage translates to price. And also the social norms based comparisons – we aggregate a lot of data so we can present how you are doing compared to others like you in a prescribed geographic radius. So you can see how you’re doing in your neighborhood, town, county, etc. Water Deeply: Anything else you’d like our readers to know? Robb Barnitt: Another big piece is conservation tips and access to rebates. Most folks want to do the right thing, they just need access to the information to make a decision and they need some direction on what to do. So I think that’s something that we are trying to help them with in terms of convenient access to information. And we connect them to conservation tips and rebates that are specific and relevant. That’s definitely helpful for the utilities since they have rebates available for appliances and fixtures and that kind of stuff, but they don’t necessarily see a higher rate of participation in these programs. I would argue that that’s because they market them using paper and most people don’t read everything that shows up in their mailbox, but they certainly pay attention to what shows up on their phone. We’re trying to make a difference on a few different fronts.